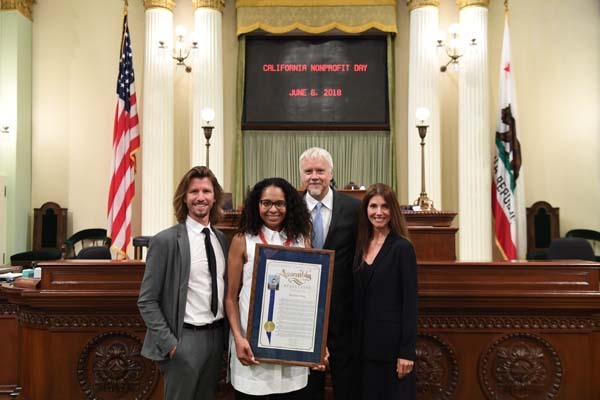 Culver City, June 6, 2018 – The Actors’ Gang is proud to announce it has been selected as a 2018 California Nonprofit of the Year by Assemblywoman Sydney Kamlager-Dove. Tim Robbins, Artistic Director of The Actors’ Gang, with Jeremie Loncka, Director of Prison Programing, and The Actors’ Gang Board Member, Malissa Shriver, joined other nonprofit leaders being honored by their state senators and assembly members at a celebratory luncheon as part of California Nonprofits Day on June 6th. Aside from touring and producing 6 shows a year at its home base in Culver City, The Actors’ Gang has a vigorous Outreach Program that serves over 3000 young students in nine Los Angeles area public schools. Through in school immersion and after school programs, the Gang teachers help to unlock the unlimited potential of young students, encouraging them to find the voice within them that has been dormant and to tell their story proudly. For the past 12 years The Actors’ Gang has been working with hundreds of incarcerated men and women in the California Correctional system, running rehabilitative workshops in 12 State Prisons as well as programs in two Re-entry Facilities and 2 Juvenile Detention Centers. The Prison Project has been recognized as effective cognitive therapy by the Department of Corrections and has been lauded by the Obama White House and by former U.S. Attorney General Eric Holder. Recent studies indicate a significant reduction in the recidivism rates of men and women that have been through the Prison Project workshops as well as an 89% reduction in 115s (in prison infractions). Both The Actors’ Gang Prison Project and the Education Department foster tolerance and nonviolent expression through improvised theatrical workshops, enabling emotional and social development for students, who often have become numb to emotion and human interaction. Ensemble building is at the heart of the work, the achievement of tasks through collective effort. In 2014 The Actors Gang was instrumental in reviving state funding for Arts in Corrections, working with the Governor, State Representatives and the Department of Corrections to reinstate funding in the state budget for rehabilitative arts programming in California prisons. Recently The Actors’ Gang has been working with the California Arts Council, Governor Brown and key representatives to increase state funding for nonprofit arts organizations throughout the state of California. California Nonprofits Day, now in its third year, was formally recognized by Assembly Concurrent Resolution 191, authored by the chair of the Assembly Select Committee on the Nonprofit Sector, Assemblywoman Monique Limón (Santa Barbara), who will speak at the celebration luncheon. The day is organized by Assemblymember Limón and CalNonprofits. According to “Causes Count,” a 2016 report commissioned by CalNonprofits, the nonprofit sector is the 4th largest industry in the state, employing nearly one million people. Each year, California nonprofits generate over $200 billion in revenue and bring in $40 billion in revenue from outside of California. The unpaid labor contributed by volunteers at nonprofits is equivalent to 450,000 full-time jobs every year.